Been playing Simutrans for a while now with pak128.Britain and was wondering if theres any underground trains or how would i go about drawing the graphics for them. if you look at http://addons.simutrans.com/?pak=128&cat=vehicles&todo=search there will be some underground trains, and many other add ons. Welcome to the forum and thanks for the interest in pak128.Britain! These were initially drawn for pak128 by Kieron Green to complement Timothy's underground addon for pak128 (which contains some of the more recent tube stock). Kieron's stuff has always been in pak128.Britain because he started the project and so therefore the stuff is graphically consistent with the rest of the pak128.Britain project - but Timothy's pak128 add-on is older and is in the graphics style of standard pak128 and doesn't quite look right in pak128.Britain (which is why it isn't in the releases). 2) Create new graphics from scratch - especially if this could be done in Blender then it would be easy to get consistency with existing vehicles. If you want to go down this route, I can provide existing blender files as starting points (with all the lighting and angles set up). Again, most welcome to do this - just ask if you aren't sure on anything. There are indeed some older addons for Pak128.Britain with underground trains, although they are not, like the rest of Pak128.Britain, open-source, nor are they balanced to fit the rest of the Pak128.Britain vehicles. Also, because they are not open source, it is not possible to adapt them to work optimally with Simutrans-Experimental. There is a plan eventually to make Underground trains for Pak128.Britain. I think that there is some suggestion that the original author of the addons to which Stubbsy referred would provide the sources for his graphics and allow The Hood to update them as necessary, although I am not sure whether that is confirmed. Indeed, there are a few very old Underground trains already in the pakset, as well as a complete set of DLR trains. If you want to have a go at drawing some new ones (Underground trains, or anything else that you think would add to the pakset, would be extremely welcome - we could do in particular with some early EMUs of all types), have a look at this thread. The easiest way to start is to ask The Hood to send you the .blend files (that is, files for the 3-d application called Blender: it is free to download) of vehicles similar to those that you want to produce, make small modifications to them, and then re-render them. Once you have some experience of doing that, you can make more and more significant modifications and eventually produce your own .blends from scratch (if you have experience of using Blender already, please forgive me if I appear condescending). Edit: The Hood, I wouldn't mind having a go at re-doing Timothy's stock - changing the contrast in The Gimp, for example, might well be a viable way of doing it. I'm not sure whether it would work, but it's worth a try. Can you PM me with the best way of contacting him to request the sources? Presumably, he's happy for them to be released under an open source licence? 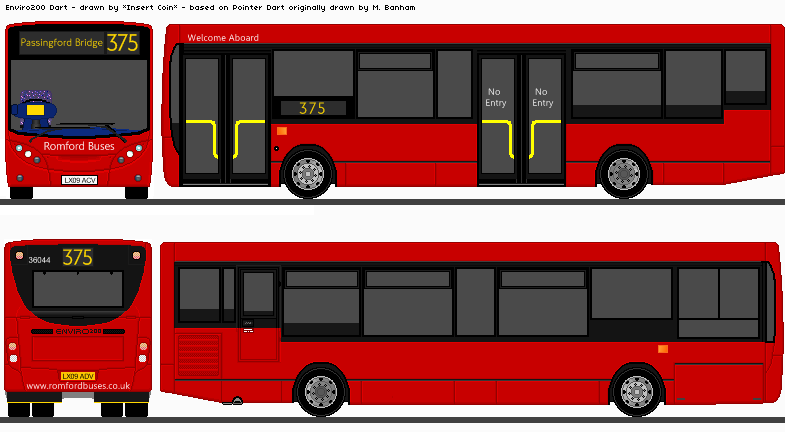 Yeah i wouldnt mind having ago at updating them as i use blender anyway for my openbve projects so should be ok its just getting them into the game.Also im pretty good at pixel painting as i do paperbuses; this being an example http://mm2rmbuses.googlepages.com/Enviro200.png (which has a few errors >:( ) but as i say its getting them into the game. I'd be happy to send you the source files, just email me at tb[at]entropy[dot]me[dot]uk and I'll send them to you. They are (as with all of my creations) subject to a BSD style licence which I'll include a copy of. I have no problems with anyone modifying/using them for use with the Simutrans project. One day I'll get around to posting all the source images online somewhere. Curiously, at least with 1.0.2, the "Metropolitan 1907 Motorised Tube Stock (middle)" is precociously available in 1898, but can never be built; in the depot window, there is always a red line under it, even after building the presumably-matching front unit. thank you very much for your interest in creating vehicles for Pak128.Britain :-) Would you like me to send you some of the .blend files that I have? (The Hood has the whole set, whereas I have a few). Getting them into the game isn't too hard - I can assist if you would like; either send me a PM or post a message in the public forum (the advantage of the latter being that anyone else with the same issue will be able to see the solution). The thread to which I pointed you is a good starting point. (Incidentally, that's a good quality picture of the 'bus - if you drew that, I am impressed :-) ). It is better to use .blends and then render them than pixel paint for Pak128.Britain for two reasons: (1) it looks more consistent with what we already have; and (2) it enables you or others to re-use the blends in making similar but slightly different vehicles that look highly consistent with the originals. That is the technique that I used to make the class 81 electric and 8p steam locomotives in the release set. Adapting Timothy's Underground set will, of course, require raster graphics skills. There is no harm in us both trying. Looks like if you're doing blends for openbve then you should have no problems with the simutrans graphics level of detail. I recommend you download the example blends from the thread jamespetts linked too (e.g. the class 67) and use the lighting and render settings in there with your models. You may need to tweak the scales a little - 1 simutrans tile = 30m in pak128.Britian, but there is some distortion on lengths on some models to make them fit. In the class 67 blend file (and others I use) 1 blender grid square = 1/16 of a simutrans tile (i.e. = 1 internal length unit as specified in the length= parameter in the dat files) so vehicles should be a whole number of grid squares long, and 2 wide. If you want the existing blends for anything, just PM me - I have most of them. For converting the render outputs into something the game understands, you can have plenty of help on this forum, but in particular I recommend looking at the existing stuff on sourceforge SVN and using the png and dat files there as templates. I might be able to source some models of tube stock from the sketchup warehouse. I just shot off an email to get permission to use it in simutrans. Has anyone been able to get Sketchup things into Simutrans so far? my entire maglev set was done through sketchup and so were the bridge parts. That sounds painful! Blender is really not that hard to work with, especially with the really very simple graphics used in Simutrans. However, if we could get some good Blender readable Collada files of Underground stock, that would be excellent - they would need scaling and rendering to match the other things in Pak128.Britain, of course, but that is doable. Edit: Could we have a sticky post in the Pak128.Britain forum about how to get Sketchup files into Blender? Here is what they (tube stock 1995 and tube stock 2009) look like under sketchup, but I think the paint will need to be redone under blender. There are also 1938, 1978, C69/77 and D78 stock on the warehouse, but there's just no way to contact the makers. Hmm. I have tried importing these, but they are very difficult to work with in their current state: the models are, effectively, all one object (for all four vehicles) with a byzantine polygonal structure. Painting these properly will be a monumental effort - probably greater than or equal to starting from scratch with some much simpler models and modifying them as necessary for all the various flavours of tube stock (which are all quite similar in basic shape). Thank you very much for trying, however. I looked at these - a labour of love I can well imagine! Unfortunately, they don't fit the scale or style of Pak128.Britain, which is a great shame, as if they did, they'd save us a great deal of work. 1) Timothy's underground trains are excellent but not fitting the style of pak128.Britain. I'm not sure about scale - Timothy could you confirm what scale you used? If the scale is compatible maybe a touch of reshading can do the trick. It would be a shame not to use such good drawings that took so long. If not the same scale, it's definitely time to draw some new versions. I do have plans involving the tube tunnel graphics and the stations though - do you have the sources for these Timothy and do you mind me using/adapting them? I wasn't suggesting they be used, just providing a link since there has been some discussion. They were made to the same scale as other pak128 vehicles. please tell me if these are better. They should have the components/pieces and detail on faces saved, but I'm not sure if they are selectable through blender. In meshlabs, I looked at the skeletal and all the details are preserved. If we are starting from scratch with this (as seems likely), I might be able to assist with research and producing some vehicles. Once we are ready or nearly to make a start, we can discuss the division of work. It strikes me that, because tube stock vehicles from about the 1920s onwards are all of very similar shape to each other, producing a good vareity of tube stock should be relatively straightforward. tube stock must conform to some fairly strict size tolerances, while subsurface stock is similar to normal trains. dimensions are here: http://www.trainweb.org/tubeprune/Dimensions.htm#Dimensions however, these are only the outer portions and are not very detailed about where the body starts to bend. Ahh, interesting. Although I ride on both types of Underground trains regularly, having the exact measurements is useful for scaling purposes. Just a quick question about your station images - the pspimages are not files I can open, so I can only get at the pngs. Do the pspimages contain layers? I would like to replace the tracks with pak128.Britain tracks and add player colours instead of the red, green and blue tiling. It's not impossible using just the pngs, but if the pspimages have layers that would be easier, if only I could open them (without buying paint shop pro). If so, is there any chance you could export them into something that GIMP could open as a layered file? So far I've added player colours, darkened the whole image and removed some of the "comic" style outlines. I'm currently debating whether to remove some or all of the black outlining at the portals, but probably not. I also don't think the tracks are massively out of place after darkening, and they do align. I'm currently thinking of leaving them as they appear on the right hand image. They were created using Paint Shop Pro 8 if I recall correctly. I don't even have a copy of it any more since switching to Mac. And yes, they do have layers. The edited version certainly looks more like the rest of the graphics in pak.Britain, it's a shame my proposal for automatic way-objects for underground track (e.g. tunnels) never got implemented. Wasn't there a proposal (implemented?) that allows a specific type of track to be used with a specific tunnel? If so, I'm planning on using the (adapted) tube electrification graphics as a waytype (rather than way-object) associated with a tube tunnel, which will have narrower bore on the entrance graphic. This will fit in with experimental's way constraint for tube tunnel to differentiate between tube and subsurface stock. I'll do a separate 4th rail electrification as a way-object for use both above and below ground. It's good to be able to reuse these graphics. Unfortunately I don't think the tube stock fits the scale, otherwise I'd attempt a similar recolouring for them. Pak128.Britain rail vehicles are 30m per tile, so length=8 (as all the tube graphics are) gives 15m. Tube stock is about 17-18m i.e. length=9-10. Pak128.Britain rail vehicles are 30m per tile, so length=8 (as all the tube graphics are) gives 15m. Tube stock is about 17-18m i.e. length=9-10. Err... are you sure? See the below screenshot. These Mk. I carriages (not rescaled by me) take more than 75% of a tile. Mk. I carriages are 57ft (source), and 57ft is equivalent to just over 17m (source). They should be around 56% of the length of the tile if that scale is correct. This is significant, since I have been scaling things using the Mk. I carriage underframes as a base. Hmm - you are right: 57ft is the length of the suburban stock; 63ft 6 is the length of the normal stock. I had mistakenly thought that the 57ft length was the length of the normal stock. Drat - this means that I shall have to re-scale all the early carriages again. Here's the remodelled tube track with pak128.Britain tracks and slopes. This time it's the internal way of a tunnel rather than an electrification way-object. It will need electrification as normal, and I intend to add 4th rail electrification graphics. The one problem is the lack of front image for ways means there are a couple of minor glitches, but overall it's not bad I think. The only thing I want to do is remove the annoying underground pavement (this is what is causing the grey gridlines). Is this possible to disable? That looks very nice! I wonder whether we could have some sort of internal tunnel graphics for ordinary tunnels, too? Am I right in recalling that your plan is to use ordinary tunnels for sub-surface stock? James, to answer your question, ultimately it would be nice to have tunnel graphics for each type of tunnel, but that won't happen right away. And yes, subsurface stock to use ordinary tunnels. Splendid! I keep forgetting to ask Kieron for the .blends of the early subsurface stock that he has done so that I can modify them - do you think that you could get them uploaded to the .blends repository?